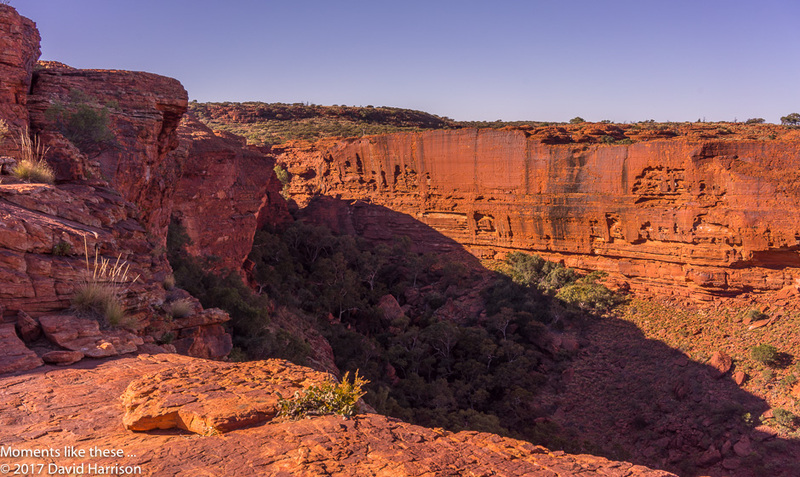 Everyone we spoke to said Kings Canyon and the Rim Walk should not be missed in any visit to the Red Centre of Australia. They’re right. After climbing up the more than 500 steps of “heart attack hill” you then walk round the rim of a glorious rock garden with lots of dead trees giving new meaning to “a solitary tree” in the photographer’s stock photo. Lots more to see on Google Photos, if you want to enjoy the full experience. This entry was posted in Landscape, Trips and tagged 2017, Australia, dead tree, Kings Canyon. The thing I remember from my Red Centre trip was the problems with the depth of shadows. Of course, that being 1977, I was using Kodachrome and didn’t really know about the issue until later. It looks as if you were able to recover enough from the King’s Canyon shots, whereas there really was nothing in the shadows with my slide film! Ah! Yes. The wonders of Lightroom, RAW and the gospel of shooting to the right (histogram). I had always thought it best to overexpose slightly as it would enable you to get all the detail in the highlights. I’ve been converted to the doctrine of underexposure (slightly) – you can always put the detail back by changing the exposure and contrast and then adding a touch of magenta, and increasing saturation.